(5,500 words) Open pdf version in a new window. Open Word version in a new window. 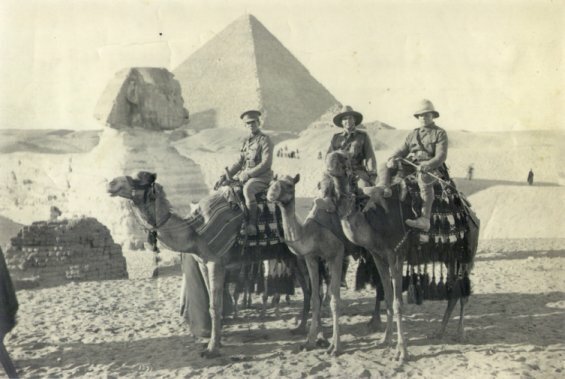 Three Henderson brothers saw service in World War I and two (Rupert and Alan) died in Gallipoli. Kenneth served in France as a chaplain to the Forces and was invalided home in 1918. Much of his experience is recorded in his book Khaki and Cassock, published in 1919. The Henderson family was literate and close-knit, a product of their strong Christian faith and the years of peace following the depression of the 1890s, the Boxer Rising, the Boer War and Federation. George Henderson was a well-regarded Estate Agent and Valuer, and his wife Jessie a strong and handsome woman, devoted to her family and committed to the welfare of the poor and under-privileged. The supremacy of the British Empire was assured; Australia was modestly affluent and her loyalty and closeness to the "Mother Country" were unquestioned. When war threatened in 1914 it seemed to her young men a huge adventure, a welcome challenge to their predictable and unexciting lives and a chance to be part of a larger world order. Given the rightness of the cause a victorious outcome was assured. They could not envisage the ghastly and debilitating toll of war in the Dardanelles and in France, and the final price in the lives of young men on both sides of the conflict. There were four Henderson brothers and two younger sisters. The youngest boy, Wilton, drops out of their story in 1906, at the age of ten, with appendicitis. All were enrolled in 1903 as Foundation Scholars in the new Grammar School established in association with Holy Trinity Church of England in Kew, Victoria. The elder three grew up with the school, active in sports, leadership and the Cadet Corps. Kenneth was an outstanding scholar who won a scholarship to Trinity College in the University of Melbourne. Rupert and Alan were not destined for academic careers but both matriculated, Rupert to enter his father's business and Alan for accountancy and also in his father's office. On leaving school both Rupert and Alan joined the Militia and Citizen Forces. Alan served as a Sergeant and Rupert was commissioned as 2nd Lieutenant and attained the rank of Captain. This was part-time soldiering and we have one letter from a camp in 1913. 6.30 Reveille Rouse out and roll call. The roll call at this parade is very large. Consequently the men are no sooner dismissed to wash and dress than they are fallen in again for 7-8 parade. 8 Breakfast. Sergeants start when men are all through, very seldom get a comfortable one. Then all alternately parade and meal close on one another till tea-then off duty. Must go now, Mum, don't get nervous about anything, am as fit as a fiddle. In June 1914 Alan writes to his brother Kenneth ("Prof") in Sydney telling that he had failed in book-keeping "as I expected". He reports on the 21st birthday party of Kenneth's fiancée Sharley and says that he has applied for a commission. "Things are fairly satisfactory as far as my work goes, but apparently the Boss does not intend paying more than the Wages Board salaries... I'm getting £1 now, £1.5 next year, £1.12/6 next and £2.8 next. The last of course is rather solid. I won't get anything much better in any other accountant's office and the training is very good". All other letters were written after their enlistment in the First Australian Imperial Force (AIF). On the outbreak of war in August 1914 both Rupert and Alan joined the 7th Battalion, 2nd Infantry Brigade, of the 1st AIF, Rupert as Captain and Alan initially as a sergeant. His commission appears to have come through within a few weeks. Kenneth was about to be ordained in December 1914 and married in January, so that his enlistment was deferred. Rupert was then aged 22 and Alan 20. They had the full support of their parents who shared the common tide of patriotic fervour and enthusiasm for the cause of Empire. George G Henderson was personally known to their Commanding Officer, Colonel 'Pompey' Elliott. They left behind two young sisters, Peggy, a lively schoolgirl of 14 and Lynette, aged six but still known to them as Baby. These letters have survived 90 years as a random collection in an old suitcase, many in their original envelopes and mercifully preserved from damp and marauding insects. Some bear Egyptian stamps and some are stamped by the Army postal service. A few of the later letters are "Passed by Censor" but the only deletion apparent is obviously an afterthought on the part of the writer. The chief intent of the letters was the reassurance of their parents as to their health and safety. They therefore convey nothing of the horror and chaos of warfare, except for Rupert's last rushed and crowded card written on the Gallipoli battlefield a few days before his death. Their only complaints are of the tedium of camp life and the uncertainty of their future movements. A convincing picture of the true carnage and waste of young lives emerges from the letters of their CO Colonel "Pompey" Elliott, to their parents soon after their deaths in action. The letters of Rupert and Alan emphasise the strong bonds of affection between the boys and their parents and sisters, and the strong Christian faith in the family. They had many friends and there must have been many other letters, particularly to the elder brother, Kenneth, to which we have no access now. The letters are their sole legacy. One or two minor omissions have been dictated by personal considerations. I am indebted to Maggie Helass for helping me to publish them.